Associate composer with The Contemporary Music Centre Ireland. 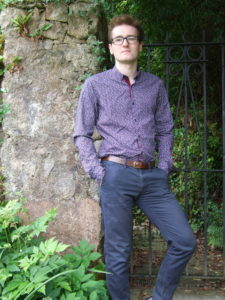 Anselm McDonnell is a Northern Irish composer based in Belfast. His instrumental and choral works often integrate extended techniques and theatrical elements such as vocalisation or stage directions alongside more conventional writing to increase the dramatic impact of the work. His work has been performed in Japan, Russia, France and various locations around the UK and Ireland, with his first American premiere taking place in New York, December 2018. Anselm has worked with ensembles such as the BBC Singers, BBC National Orchestra of Wales, Ulster Orchestra, St. Salvator’s Chapel Choir, Hard Rain Soloist Ensemble, C4 Choir, The Assembly Project, Grosvenor Chorale, Ficino Ensemble, Cantiunculae Chamber Choir, Rosetta Contemporary Music Ensemble (Japan) and Gallery of Actual Music Ensemble (Russia). He has also worked collaboratively with individual performers: pianist Isabelle O’Connell, guitarist Chris Roberts, Andrew Budden from Psappha and Laura Sinnerton from the BBC NOW. Competitively, Anselm was privileged to be a finalist in the Peter Rosser Composition Award run by the HRSE (twice, in 2015 and 2018) and to receive 1st prize in the Feis Ceoil Choral Composition Competition 2017 and the Chamber Ensemble Competition 2018. In July 2018 a collection of his choral works was awarded first prize in the 3rd International Kastalsky Choral Writing Competition, with the possibility of a performance in Moscow. His first recorded choral piece, ‘Hinneni’ was commercially released by the St. Salvatore’s Chapel Choir on a CD celebrating the music of Sir James MacMillan, ‘Annunciations’. ‘Hinneni’ was performed by the choir on tour in venues in Paris, London and Edinburgh. The CD is available from Presto Classical. 2018 saw several international performances: in May the Russian premiere of a chamber trio that was selected for the final of the 3rd International Sergei Slonimsky Competition in St. Petersburg. In August 2018, two of the movements from Anselm’s suite for guitar ‘Eyewitnesses of His Majesty’ received their East Asian premiere in Kyoto, Japan. Choral works also formed a major part of Anselm’s musical activity in 2018. In December the C4 choir will perform A Slave in the Land of Liberty in Manhattan, a world premiere and Anselm’s first American performance. Anselm has also been commissioned by the Rhinegold publication Choir & Organ to write a new work for Easter 2019, which will be printed in the magazine and available to choirs internationally.